RNAS Hal Far unit badge. Air field Hal Far (also known as RAF Hal Far, RNAS Hal Far or 'HMS Falcon', ICAO: ??) was a British air base on the Mediteranean island of Malta. The airfield was constructed in 1922 and on 16 January 1923 it was opened by the Governor of Malta, Lord H. Plumer. The airfield was built to complement the sea plane base at RAF Calafrana and being the first land based airfield it was simply named 'Malta'. It took a full year before the first aircraft landed at the airfield. Until the 1930s, Hal Far served as the Maltese landing site for all civilian and military landplanes. In 1928 Hal Far underwent extension work in order to accommodate flying boats and to facilitate construction hangars and workshops it was enlarged and improved. The airfield was taken over by the RAF, and a Station Flight with Fairey IIIFs was formed. The Fleet Air Arm, however, continued to use RAF Hal Far as RNAS Hal Far as a shore-base for its carrier-based aircraft. The strategic importance of Hal Far, and eventually Malta, was proven when Italy declared the Abyssinian War on 27 September 1935. On 23rd November 1936, a whirlwind, still vividly remembered by Maltese veterans, hit RAF Hal Far, causing irrepairable damage to hangars and many aircraft, including some from HMS Hermes and HMS Eagle. The outbreak of World War II saw Hal Far literally void of good aircraft that could withstand enemy attacks. When Air Commodore Maynard took charge in January 1940 he found the total 'strength' consisted of four Swordfish aircraft, a handful of Sea Gladiators and a radio-controlled Queen-Bee. 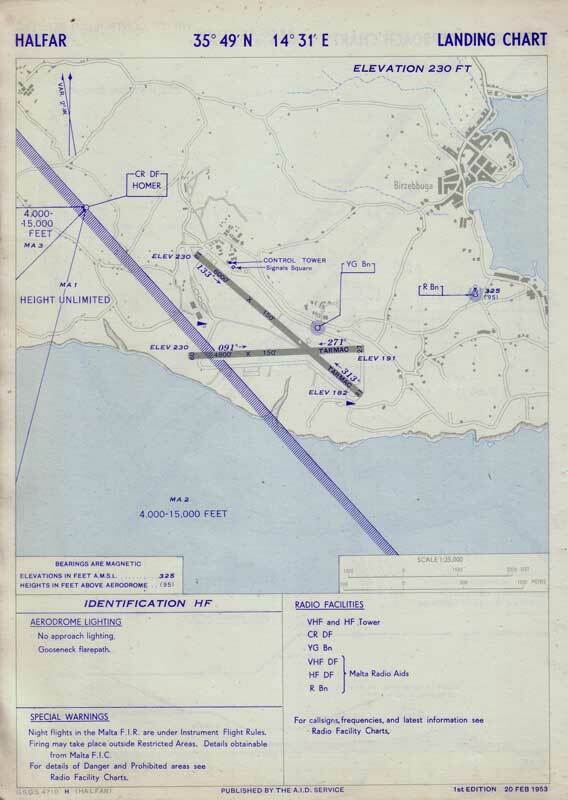 The E-W runway was extended by January 1941 to 2,700 feet. A year later the NE-SW runway had been increased to 3,300x600 feet and extensions were underway for the N-S and E-W runways to be completed by October 1941, with widths varying from 450 to 600 feet. Orders had been given in October 1941 to further increase the NW-SE runway to 6000feet as the airfield was still unsuitable for use by bombers. 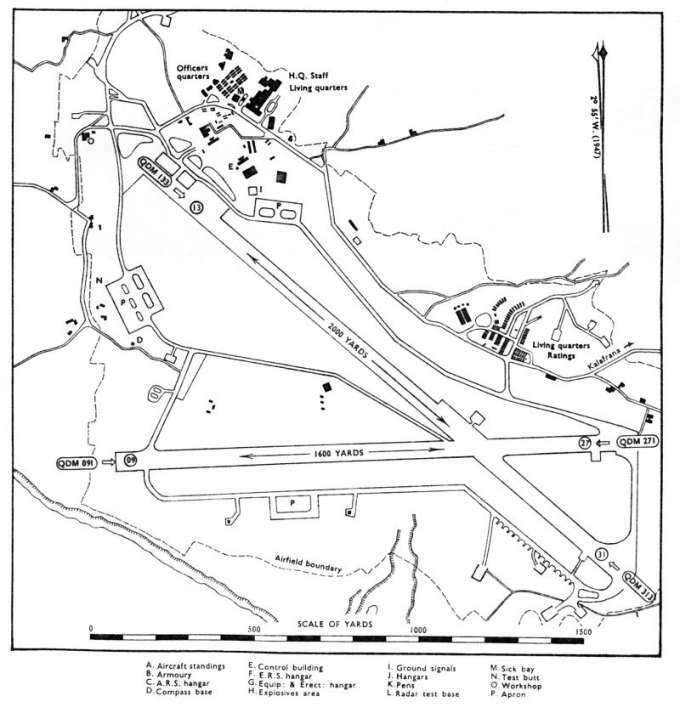 All installations were listed on the northern corner, such as barracks, offices and quarters, wireless and direction finding stations, flight shed, Bellman Hangar and a transportable hangar. Later a torpedo store was located on the noth-west corner together with petrol storage for 12,000 gallons. The bomb store was at the southern end of the NE/SW runway. 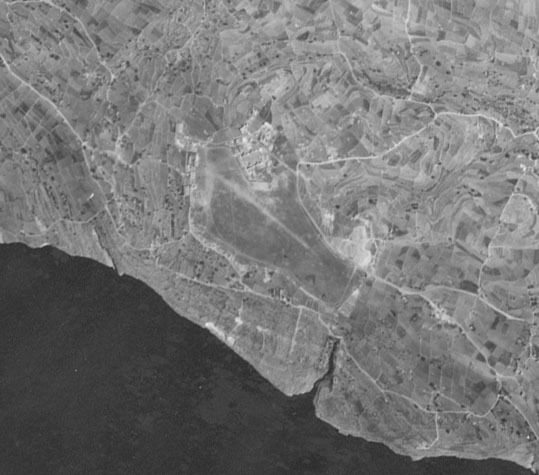 Aerial photo of Hal Far taken during World War II. Due to its strategic importance, the airfield was the target of many italians and later German air attacks. For instance, Hal Far was dive-bombed by no less than twenty Junkers Ju87 Stukas on 15 September, 1940. Throughout 1941, Hurricanes and Supermarine Spitfires operated non-stop from the airfield against enemy aircraft and shipping. 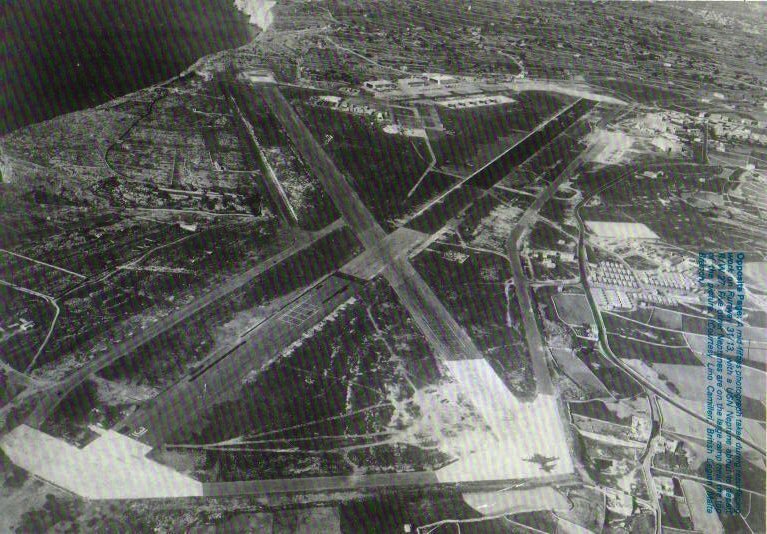 Several runways underwent extensions, and work was completed early in 1942. The increasing number of air crashes around Malta brought about the need of a SAR flight which was formed in 1943, initially operating a single Supermarine Walrus, but later adding a Bristol Beaufort, two Vickers Wellingtons and the last remaining Swordfish of 830 Squadron, coded 'P'. 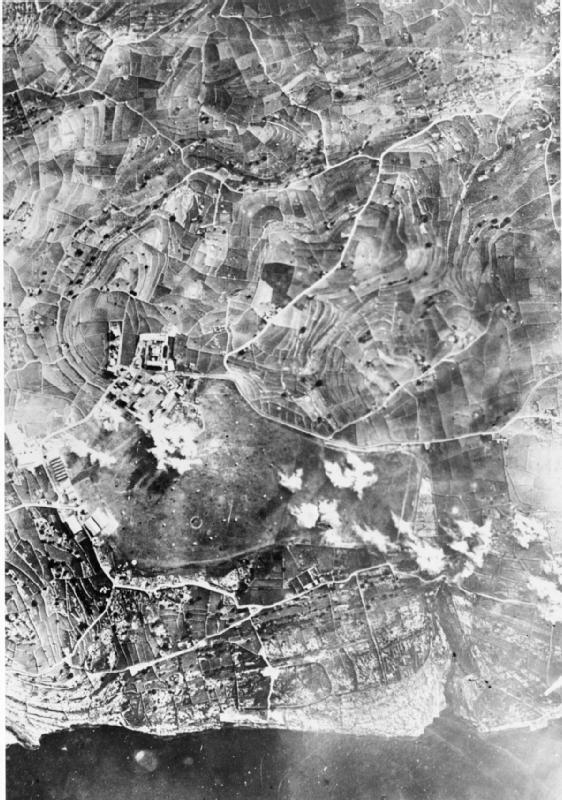 On 21 May 1943, RAF Hal Far suffered its last attack, resulting in a total amount of 2300 tons of bombs dropped on the airfield, killing 30 persons and injuring 84 others. By summer the airfield served as a staging post for a great number of Spitfires and Curtiss Kittyhawks of various squadrons, in preparation to the Alied landings in Sicily. Spitfires continued to be the backbone of Hal Fars aircraft strength, but in 1944, planes from the Fleet Air Arm began coming in at great numbers with aircraft-carriers deploying their flights to Hal Far. 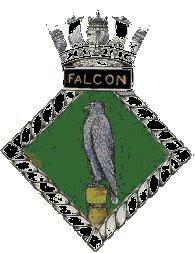 Such was the influx of FAA aircraft, that Hal Far was decommissioned as an RAF base and on 14 April Hal Far became officially known as HMS Falcon. 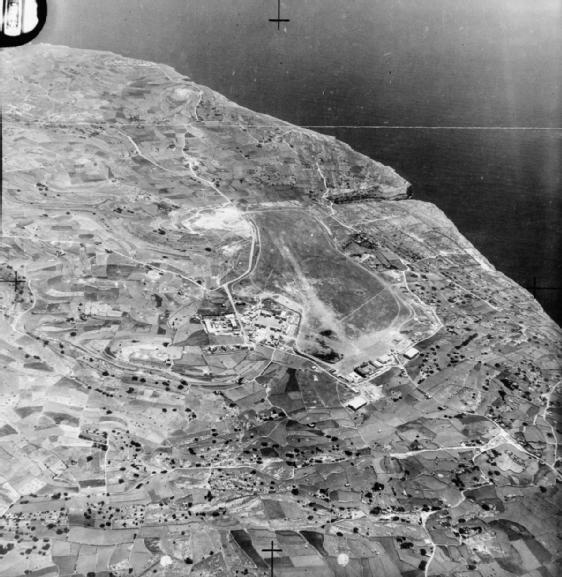 Vertical aerial photograph taken during a bombing attack by the Regia Aeronautica (Royal Italian Air Force) on Hal Far airfield, Malta. Bombs can be seen exploding on the installation in the northern corner of the airfield and over its eastern perimeter (ItAF photo, via IWM). Malta received Winston Churchill, F.D. Roosevelt and Joseph Stalin in January 1945 for the Malta Conference. They were protected by 9 Spitfires and 6 Mosquitos operating from Hal Far. 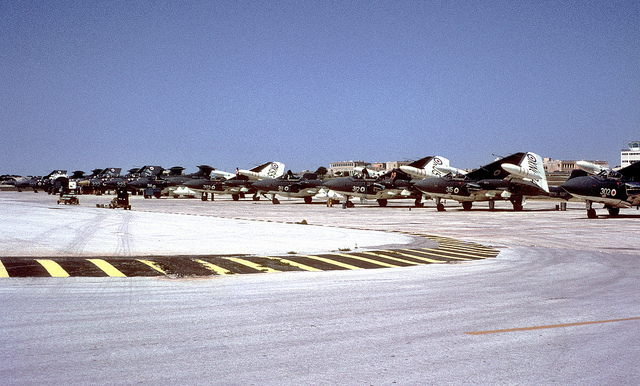 In the 1950s Hal Far received new runways to handle jet aircraft and became host to so-called 'summer-camps' of the Royal Naval Volunteer Reserve Air Divisions. These 'summer-camps' occurred between 1950 and 1956 and involved many flying and bombing exercises. 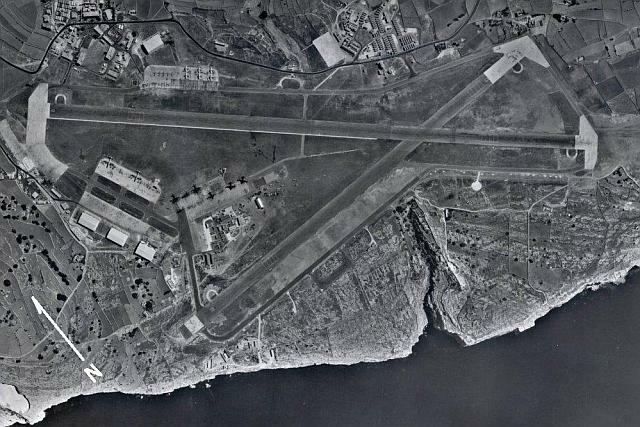 In 1957 it briefly became a civilian airport again when Luqas runways needed resurfacing. Map of HMS Falcon (RNAS Hal Far) in the 1950s (source). 1958, Grumman F9F-8P "Cougars" BuNo 144416/AC966 and BuNo 144417/AC967 of Det. 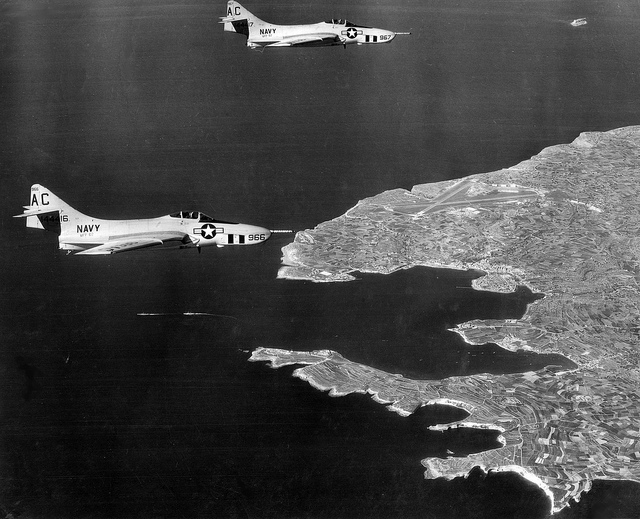 43 - Photo Reconnaissance Squadron VFP-62, "Fighting Photos" assigned to CVG-3 aboard the USS Saratoga (CVA-60) over Malta. Notice RAF Hal Far in the background (USN, via aeroman3, on Flickr). 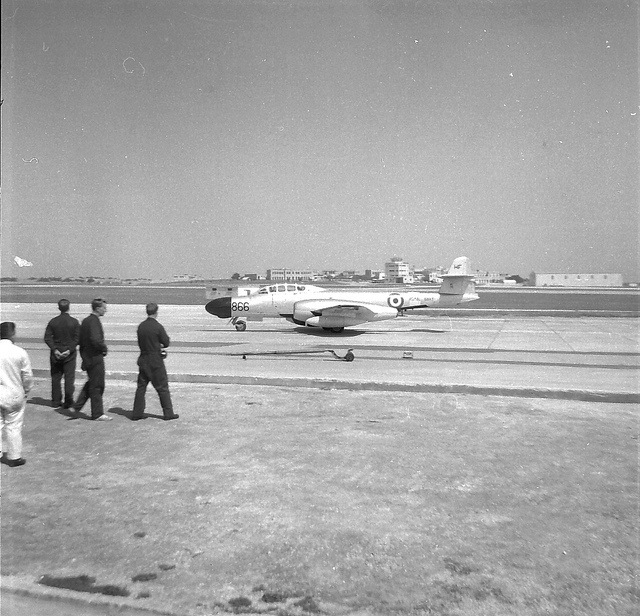 USN Neptune preparing to take off from RWY27 during the resurfacing of runway 13/31 in 1959. RNAS Hal Far, taken ca. 1960A Canberra U Mk.10 pilotless drone aircraft used in Sea Slug guided missile trials from HMS Girdle Ness, at RNAS Hal Far, Malta, June 1961 (© Crown copyright. IWM (A 34464)). Buccaneers of 809 Sqn FAA and Sea Vixens of 892 Sqn FAA, embarked on HMS Hermes in 1966, ashore at the RAF Hal Far dispersal (by rac819, on Flickr). 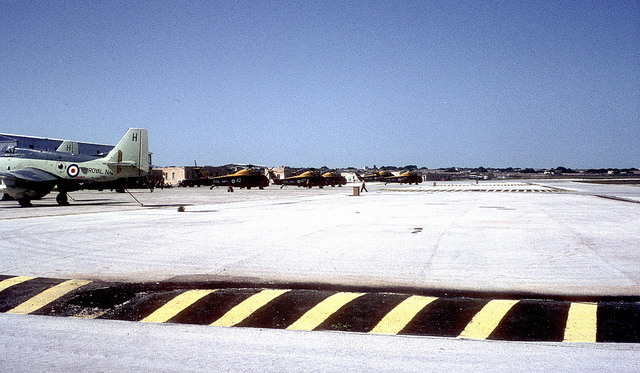 728 Sqn FRU taxiing out to the runway at RAF Hal Far, Malta 1966 (by rac819, on Flickr). 728 FRU/Sqn at Hal Far dispersal, 1966 (rac819, on Flickr). Gannets and Wessex at Hal Far in 1966 (rac819, on Flickr). 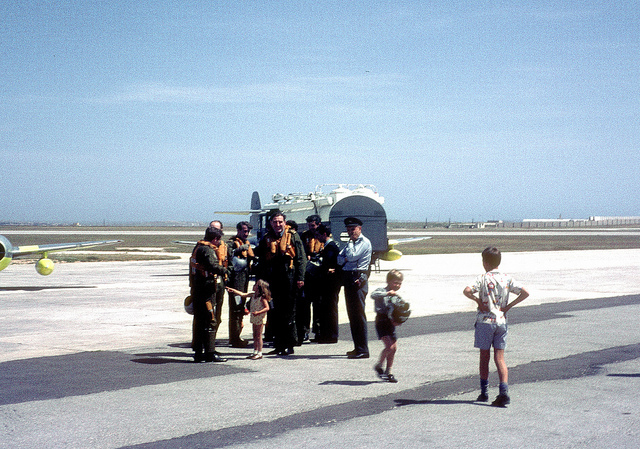 Imagine this scene on a flight-line today: 728 FRU Squadron aircrew and children mixing on the flightline at RAF Hal Far, Malta, in 1966. CO of 728 Sqdn, LtCdr Peter Wreford, is standing in the centre of the group (rac819, on Flickr). 728 Sqdn Meteor, after landing at Hal Far after the squadron disbandment fly past in 1967. Notice the control tower in the background, which survives to this day (rac819, on Flickr). 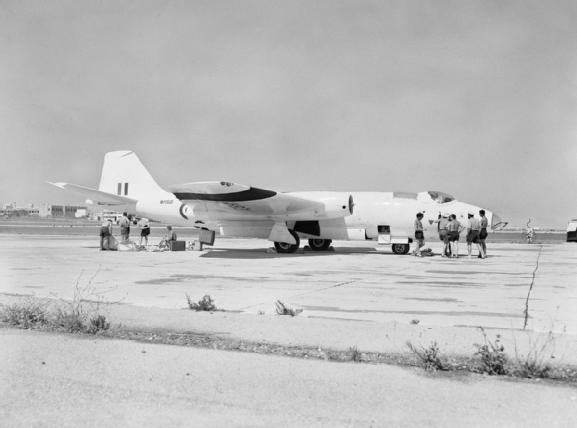 After the departure of the RAF, Hal Far was placed on a 'care and maintenance' status as a satellite for Luqa. 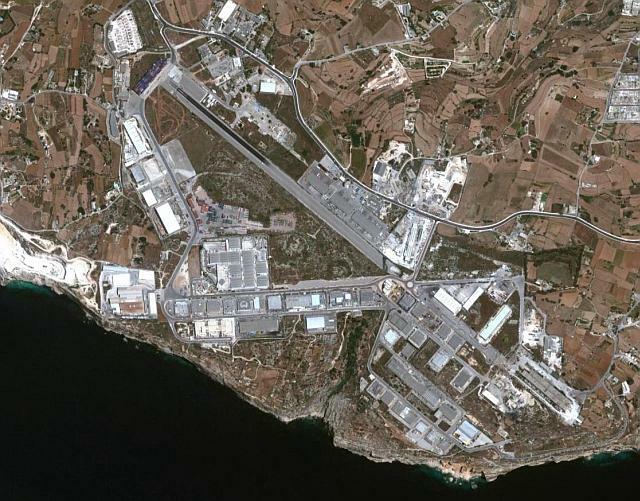 The move ended 43 years of RAF activity on Malta's oldest and most historical airfield. However, between March 1967 and its ultimate closure as an airfield it continued to serve. For 10 years it was a base for the American aircraft maintenance company MIACo. In addition it was home to the fledgling Air Wing of the Armed Forces of Malta (AFM), consisting of 3 ex-Lybian Alouette III helicopters. 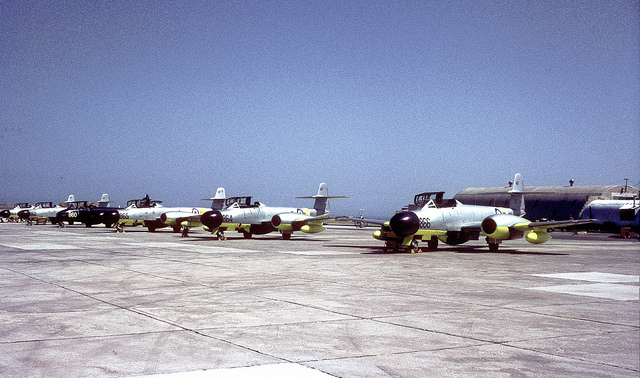 The Maltese Government planned to convert Hal Far airfield into an industrial area, so MIACo was asked to vacate its hangars and offices by September 1978. Construction of the industrial area began around 1982, when the first company began building on the east side of runway 09. 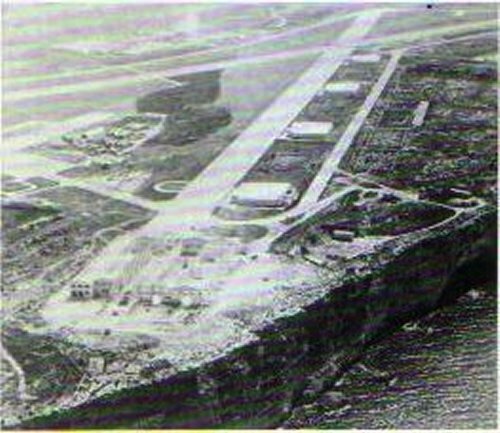 Both runways were dug up and further development of the area reduced the airfield to a scar on the land. Runway 13/31 is currently being used by the Malta Drag Racing Association as a quarter mile dragstrip, while runway 09/27 is now a public road linking the various sections of the industrial area. The control tower and the officer's quarters are still intact, together with a few Nissen huts. The kitchens and mess halls, the electricians and radio section cabin are still standing, but in a worrying state. 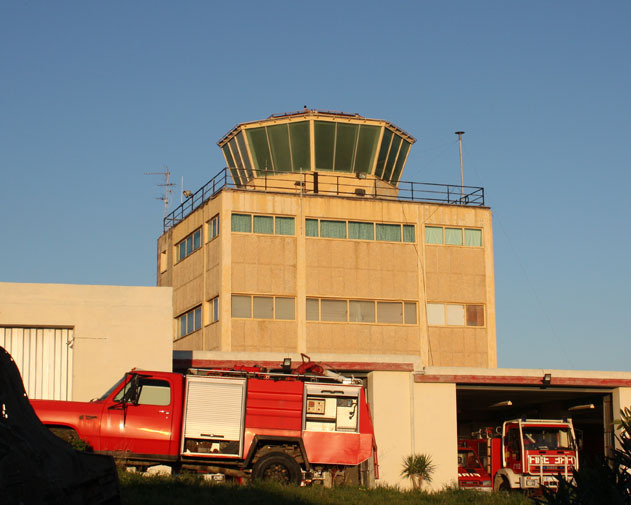 Hal Far in 2009, the airfield is still recognisable and many buildings still remain. A nice site about British forces in Malta, with many photos of the early years of Hal Far and other air stations.